Living with Parkinson’s Disease can make everyday activities incredibly difficult. Eating is often a challenge because the tremors caused by Parkinson’s make it hard to get food to the mouth without making a mess. A new spoon made just for people with Parkinson’s and other tremor-causing conditions is about to make life much easier. 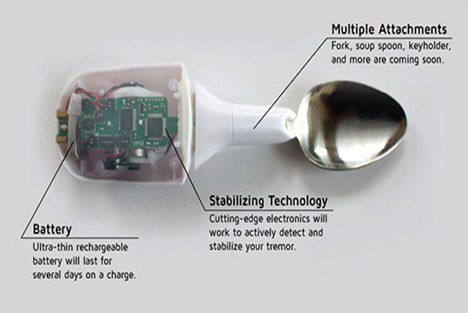 The Liftware Spoon has a built-in microchips and sensors which cancel out movement made by the user’s hand tremors. The spoon counters tremors up to two inches, making the act of eating a much more enjoyable and less stressful endeavor. Although the tremor-correcting technology isn’t quite perfect, it does greatly reduce the incidence of embarrassing tremor-related spills. The device is powered by a small, thin battery that can last for up to several days on a single charge. 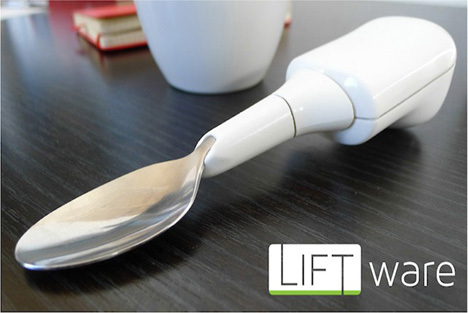 LiftWare plans to release interchangeable attachments for the base in the future, including a fork and a key holder. See more in Home & Personal or under Gadgets. October, 2013.